Westwater Canyon is a proposed Wild & Scenic River and combines all the components of a classic river trip: excellent whitewater, charming campsites, and great hikes. 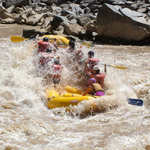 Part of the time you will drift leisurely at the rivers pace; then there is one day of extremely fun rapids. The Colorado River forces its way into narrow Black Granite Gorge forming renowned rapids like Little Hummer, Funnel Falls, Last Chance and the infamous Skull Rapid. The first part of this adventure places you in the midst of stark and dramatic desert landscapes. There are two sections to Westwater Canyon with great contrast between the serene solitude of the upper canyon's sandstone walls and the lower canyon's black granite walls and impressive rapids. The awesome landscape and exhilarating rapids motivate you to release your busy life and embrace an adventurous, positive outlook. 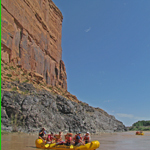 This trip starts higher up the Colorado River than the 2 day so you get to see more of the beautiful canyons. the extra day also allows for more time to explore the hidden wonders of this popular area. 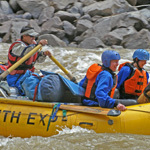 This trip is the best short whitewater trip in the West: a legendary remote canyon of powerful rapids and outstanding canyon scenery. You don’t have to be experienced, just be looking for some adventure and a lot of fun. A great trip if you're looking for a vacation that takes care of all the details. 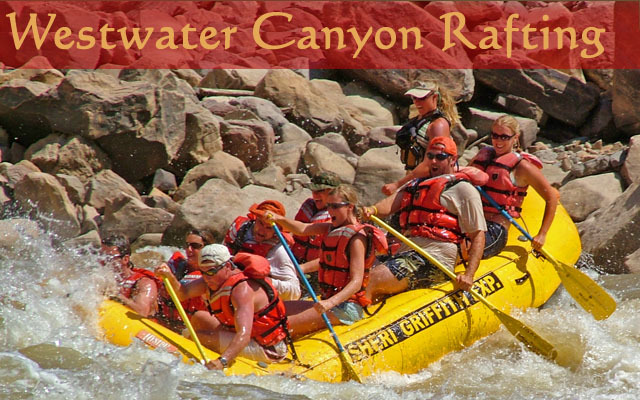 Activities include: exploring secret amphitheaters, arches, and Indian ruins, rafting Westwater Canyon, and horseback ride through picturesque Castle Creek! 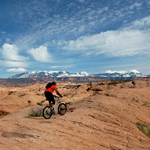 Sheri Griffith Expeditions is teaming up with the Moab Music Festival to offer a Musical Journey through Westwater Canyon on the Colorado River. For more information about this special offering, including how to reserve your seats, please visit the Moab Music Festival website.